Cirque du Soleil – La Nouba is a show not to be missed! Have you seen that white tent like structure at Downtown Disney & wondered what it is? Ever wanted to know if it is worth the price or what all the fuss is about? I recently had the opportunity to attend a show & all I have to say is “wow!” Cirque du Soleil has several shows but only La Nouba calls Downtown Disney home. From the pre-show clowns & the opening parade of characters to the finale,we were both mystified & spell-bound. Though there are 3 categories of seating, I don’t believe there is a bad seat in the theater. The title is derived from the French phrase “faire la nouba” which means to live it up, to party. La Nouba itself is meant as an adventure into imagination to transform the ordinary into extraordinary. It does so & more. The 2 clowns come out just before performance time to interact a little with the crowd. I was worried because my (not so) little one is really afraid of clowns. I soon saw my fears vanish because they are so very entertaining. They are original cast members who have worked out wonderful acts, using no words at all. I was amazed to learn that one is deaf! 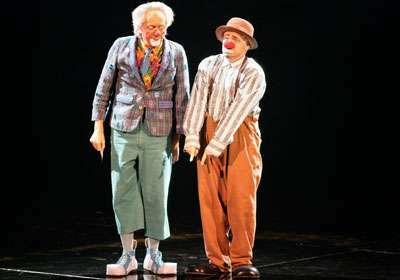 Once the clowns exit the state, the show is ready to begin! The parade of characters around the theater was wonderful. It was nice to see them a little closer & get a taste of the show we were about to behold. And what a show it is! We saw artists who jump rope better than anyone I have ever seen; Chinese girls with Chinese yo-yos, called diabolos, perform amazing feats; & a cycle act who make jump & stops with bicyles that are simply unbelievable. But that is only the beginning! High wire acts, flying trapeze artists, an ariel ballet in silk, a balancing act, an aerial cradle act, & power track/trampoline stunts all will leave you wondering “how did they do that?” the entire time. Everything is set to beautiful live music with amazing singers. The dancers, awe-inspiring costumes, & fantastic lighting effects tie the entire show together. 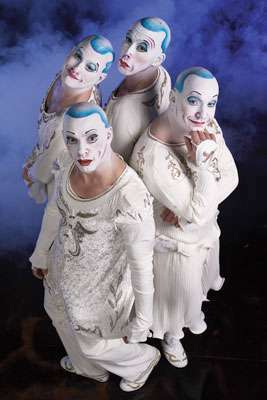 I really enjoyed Les Cons, a group of 4 men all in white who appear throughout the show. La Nouba is truly a festival for the imagination! La Nouba is a 90 minute show with no intermission. It is performed at 6pm & 9pm Tuesdays – Saturdays. Tickets can be purchase up to 6 months in advance online at www.cirquedusoliel.com/lanouba (or click here) or at the ticket box office at the theater. Discounts are offered for groups, annual passholders, & others so be sure to ask when you order. I love this show & think it is worth every penny of the ticket price! If you have never seen it, consider adding it to your next trip. You will not be disappointed! See below for some pics & a video trailer!